In my current role, I deliver advice and consultation regarding complex risk matters, assist engagement teams with internal audit matters, and am responsible for ensuring that organizations comply with professional and regulatory standards. I have experience as it relates to contract and compliance matters both nationally (at the state and federal levels) as well as internationally. I specialize in security, privacy, and risk which includes but is not limited to contract risk, internal and external policies and procedures, cybersecurity, business continuity/disaster recovery, controls, and evaluations of GDPR, CCPA, HIPAA and other regulatory compliance programs as they relate to entities, their clients, and third parties. In short, I help clients with their data. I am also a member of RSM’s blockchain practice, with a special interest in the smart contracts, cryptocurrency, and cryptofund arenas. I am very passionate about diversity and equity. 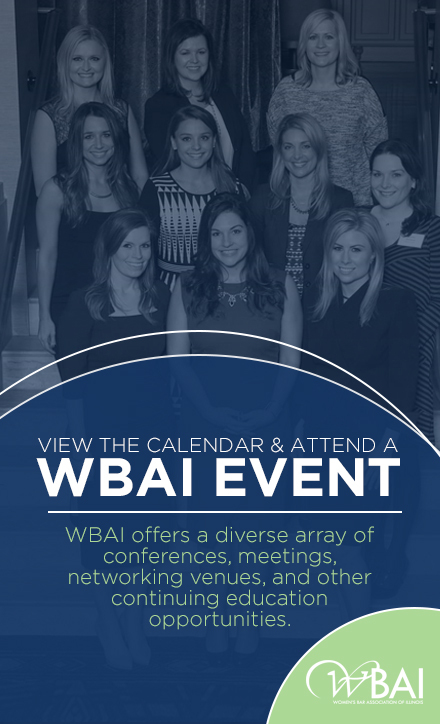 The WBAI is the premier local organization dedicated to promoting, advancing, and protecting the interests of women lawyers in Illinois. After accepting an event invitation as a law student, I witnessed a room filled with wisdom, empowerment, and sisterhood. I have been an active member ever since, doing my best to give back to my fellow women members of the Illinois bar, prospective candidates of the bar, and the community. As a member, the access available to a remarkable network, has aided my professional development, expanded my professional network and fostered a number of great friends as well. When I reflect on the WBAI’s humble beginnings, I am proud to say that we have honored the legacy of those nine brave women by growing not just in quantity, but more importantly in quality. The best way to empower women in law, in my opinion, is two-fold. To start, we must take the initiative to mentor and invest in the next generation’s professional development. Women must help one another succeed through strong networks, alliances, and resources. The other side of that coin is to identify senior level professionals in the industry, irrespective of gender, to be champions/advocates for our professional growth. This concept is, of course, quite broad. On a micro, “what can I do tomorrow?” level, I believe that we can all make a difference by setting a great example. We can do our best to succeed, reach out to others for help, volunteer to help others, and most importantly, be present and available. I will always make time to help a fellow sister in arms. Tell us about a story or time when being a female attorney was advantageous. The legal profession is changing. It is changing more rapidly today than it has since the mid- 1900s. Being a female attorney in this age of change is extremely advantageous. Firms are waking up to the competitive advantages of diversity and are looking to us for guidance. We, for the first time ever, have a hand in where the profession goes. The community of female attorneys has used its strength to create bonds, which help members and future members of the group, for years. It is only now that this community can mold the future of the profession, and that is exciting. Personally, I am most looking forward to my next trip… The top contenders include but are not limited to: the Pacific Northwest; Costa Rica; New Zealand. Comments, suggestions, recommendations, and travel stories are welcome. Professionally, I am looking forward to incorporating more learning into my schedule. I do not mean fulfilling CLE credits (although if I can feed two birds with one seed, then even better), but learning more through research and publication. I believe in learning for the sake of learning but also in teaching or otherwise sharing your knowledge with others. Fun fact: I speak five (5) languages and in my LBL (Life before Law), I was a linguist. My friends call me a “cultural chameleon” due to my interest in seemingly every culture, every country, its landscape, its people, and most importantly all the food and music that come along with it. This fascination usually takes me on unique adventures, which have yielded a broad lexicon, a refined palate, a robust assembly of dance moves, and a slew of international friendships (my phonebook looks like the UN member directory). I attribute much of this to the fact that when I first moved to this country, I was desperate to fit in somewhere, so I cast as wide of a net as I could. In doing so, I discovered my own joie de vivre: learning about people who are different from me.